In case you're a Nissan Juke enthusiast, chances are you've already heard of the Nissan Juke-R, the bad boy Crossover that goes head-to-head with the Ferrari 458 Italia, the Lamborghini Gallardo and the Mercedes Benz SLS. 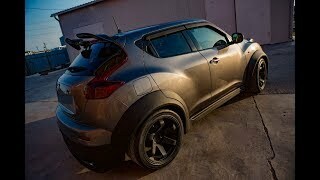 You've also heard that the Juke-R costs roughly $600,000 and most than likely, this beefed up Nissan is out of your reach, if not for the price, then because it's a highly limited edition. 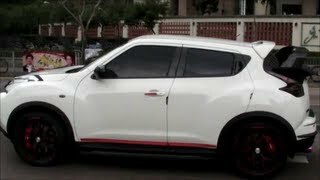 Well, if the above mentioned phenomenon left you wanting for more out of an ordinary Juke, Senner Tuning is now offering a tuning package that will make your Juke a bit more interesting. Beneath the tuned-up body the Senner Tuning Nissan Juke 2012 sports a 1.6 liter turbocharged engine, which alongside a performance racing air filter, a Power Converter, and a stainless steel sport exhaust system with four 90 X 75 mm tailpipes, can now produce 222 horsepower and 203 lb-ft of torque. That's a 35 horsepower and 26 lb-ft of torque increase, compared to the normal version. Furthermore the handling has also been improved, as Senner Tuning has fitted the Nissanwith a set of springs, resulting in a 35 mm lower ride. On the exterior the tuning package offers carbon side-view mirrors, WY21W Philips Silver Vision Chrome signal lights, LED rear registration plate lamp and a Force Red paint finish. The Senner Tuning Juke comes with a set of Barracuda Tzunamee 20-inch red polished rims mated with Vredestein Ultrac Sessanta 255/30/R20 tires. On the interior the tuned-up Juke offers little improvement, but the center console and door handles have been now painted in body color. As far as pricing goes, the Senner Tuning Nissan Juke 2012 is sold at the price of €32,730 (roughly $42,200), or you can buy the tuning package alone at the price of €7,490 (around $9,650). Overall, the Senner package will not transform your Juke into the beasty Juke-R, not even close. But the price is also $550,000 less.